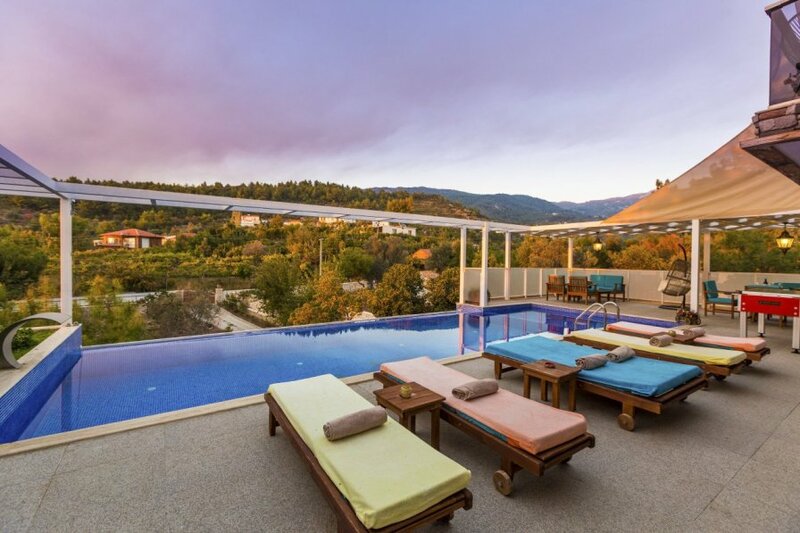 Three-bedroomed Villa Tulay is in picturesque Islamlar, a rural village nestled in the Taurus Mountains. The luxurious villa boasts uninterrupted. Three-bedroomed Villa Tulay is in picturesque Islamlar, a rural village nestled in the Taurus Mountains. The luxurious villa boasts uninterrupted, panoramic views of sandy Patara Beach and the glistening turquoise sea, and is surrounded by two acres of land for your utmost privacy. The interior is as impressive as the exterior with super-stylish decor including exposed brick walls and sky lights. Skilled architects have designed the villa, and it shows in the spacious and well-thought-out layout. There's an expansive open-plan living, kitchen and dining room with a special wooden dining table and state-of-the-art cooking appliances. On chilled evenings, sink into the comfortable cushioned sofas and watch movies on the large flat-screen television. The dining room looks out onto the terrace, with floor-to-ceiling windows and doors making the most of the tranquil views. Outside, the cliff-edge infinity pool is the perfect gathering spot for family and friends, with a bank of sun loungers and two swinging chairs in prime position for the best blue views. The pool has a mini waterfall and is split into two with a separate shallower section for children. Sun seekers can find their ideal sunbathing spot, while shade-lovers will enjoy the undercover part of the villa. You're spoilt for choice for rooms at Villa Tulay too; all are equally seductive, stylish and serene. Take your pick from two doubles and a twin. The master benefits from a chic circular bed, balcony overlooking the coastline and a jacuzzi bathtub for a spa-like feel. The twin has its own on en-suite shower room, while the double boasts a ‘luxe' tub – and both have direct access to the terrace. Homely furnishings like candles, poofs and patterned rugs add warm finishing touches, while wood accents like beams and dark furniture evoke the natural tree-lined surroundings. With the beauty of the Taurus Mountains on your doorstep, the chic amenities of Kalkan just a 20-minute drive away and the translucent water of the Lycian coast nearby, Islamlar is the perfect base to explore the best on offer in this stunning region of Turkey. Villa Tulay is in Islamlar village, nuzzled in the Taurus Mountains not far from the sophisticated Turkish town of Kalkan. The quaint village is known for its dozen-or-so trout restaurants making use of icy mountain streams to fill their tanks. In the village square, have a look at one of two working mills that still use water power and a great millstone to turn residents' grain into flour. This incredibly beautiful area offers a compelling combination of a peaceful, utterly unspoilt terrain. The villa is close to parts of the famous Lycian Way – it's a spectacular walking route that has breath-taking views over the coast from above Kas and Kalkan and goes to remote, unspoilt places like the 12km long beach at Patara or the historic castle, harbour and ruins at Ucagiz. For exploring further, a twenty-minute drive will take you to Kalkan, an old fishing town and harbour between Kas and Fethiye. It's famous for its white-washed houses draped in brightly coloured bougainvillaea flowers. Dine on a roof terrace restaurant or bar with beautiful views of the town or while away the afternoon at one of the many harbour-side restaurants. There are plenty more swimming beaches in Kalkan including Kaputas and Patara, as well a many beach clubs built into Kalkan's rugged coastline. You can take part in water sports or head out on a traditional wooden gulet (sailing boat) to experience the full beauty of the Turquoise Coast, with time for a swim or snorkel.